The Republic of The Gambia, commonly referred to as The Gambia, or Gambia, is a country in West Africa. Gambia is the smallest country on mainland Africa, surrounded by Senegal except for a short coastline on the Atlantic Ocean in the west. The country is situated around the Gambia River, the nation’s namesake, which flows through the country’s centre and empties into the Atlantic Ocean. Its area is almost 10,500 km² with an estimated population of 1,700,000. 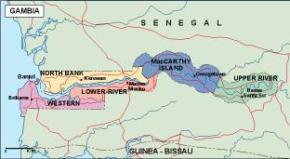 The Gambia is a very small and narrow country whose borders mirror the meandering Gambia River. The country is less than 48.2 km wide at its widest point, with a total area of 11,300 km². 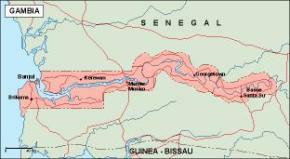 Approximately 1,300 km² of The Gambia’s area is covered by water. 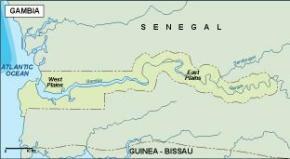 The Gambia is the smallest country on the continent of Africa. In comparative terms the Gambia has a total area which is slightly less than that of the island of Jamaica. The western side of the country borders the North Atlantic Ocean with 50 miles of coastline.